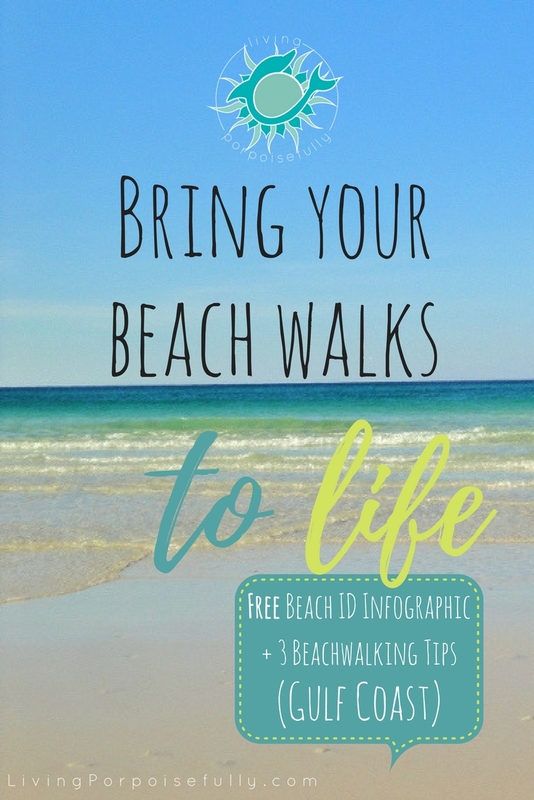 To bring your beach walks to a whole new level, we’re sharing our handy beach ID infographic, along with 3 tips to getting the best beach-life viewing experience. One of our favorite past times, as you might guess, is walking the beach in search of sea life. You never know what you might see — and trying to identify it can be a puzzle in itself! And what about things you may have overlooked, not even knowing they’re there? So, we’ve put together a little something that will give you a much richer beach walk experience. Get ready to bring your beach walks to a whole new level on our travel escape today. Enjoy! Your sightings will depend on the conditions. If it’s calm, look in the shallows. If it’s rough, look up on the shore for cast-aways. Depending on the wind and weather, you may encounter some cast-aways that wash up on shore. Some, like the Portuguese man-o-war can sting (even if they appear to be dead), so be careful! You might find some relatives of the Portuguese man-o-war too, like the moon jellyfish. Their tentacles are much shorter and not nearly as powerful (if you touch the tentacles, you may feel a tiny sting or even none at all). Depending on conditions, you might see sea hares (aka sea slugs, basically snails without shells) in the shallows where they look like flying angels or up on the shore where they look like globs of greenish-brown goo. In almost all conditions, the sandpipers and gulls are reliable residents. The sandpipers are one of our favorite beach company, and they go about digging for snacks without a bother! Find a beach, or parts of the beach, that are mostly people-free. This might mean walking a ways down to areas that are quieter, finding a state park beach off the beaten path, or going at times of the day that are unfrequented (see Tip #3). Obviously, less people mean more wildlife will be out and about in their element! Go either early in the morning or in the evening to get the best sightings. The critters are up and hungry for breakfast, then typically scatter when more people hit the beach. In the morning, from sunrise to about 8 or 9 is when we usually like to go in order to see the most wildlife. Great blue herons are one of our favorite sightings that make it all worth the early morning. Be sure to approach quietly and slowly, and keep your distance…otherwise they’ll fly the coop pretty fast! You’ll get a different photo opp depending on the time of day (and camera angle of course). Not only are great blue herons a rewarding morning sighting, but the ghost crabs (who stay true to their name and are usually ghost during the day) are out scurrying about in the morning. We loved watching them scurry just ahead of us, ducking into their tunnels every now and then. Look out in the water a bit too – sometimes you’ll see pelicans diving for fish, a porpoise or two, or even a shark. Some of our best sightings are ones we don’t have photos of because it was such a quick chance encounter! And to wrap it all up, here is our ID infographic we promised. Beach walks are so much more enlivening when you know what it is you’ve come across! The next time you’re at the beach, we hope you take time to soak in not only the waves and sand, but the incredible life in them too. Your beach walking experience will never be the same. Happy beach walking! P.S. – Want to pin this for later? Fantastic blog post, one of the best yet!